body language as they succeed - together. In our own dogs, most of us are looking for a good companion, worker and canine citizen, so let's look briefly at some of the things you can do to create this bonding relationship. First and foremost, you should spend quality time with your pup. Quality time not necessarily quantity time. Quality time is time spent doing things together which are rewarding and enjoyable. This is what your training sessions should be. Everything in life is relative, so if your pup has more fun at home with another dog - or just hanging around with other members of your family who play chase, or throw balls or whatever - then why should it look upon going out with you as more pleasurable? Time spent with you should be the highlight of your pup's day. And it should always be when the pup is the most receptive to learning, when he is alert, enthusiastic, and motivated to learn. A kennel or an indoor kennel house, such as an airline crate, can be a big advantage. Your pup can sleep, rest, and revitalise without interruptions inside one, and equally important, cannot learn bad habits through interacting with the environment around him without control or from other people who may unknowingly sabotage what you are trying to build. I have found it far more effective to train puppies immediately after a rest period and a quick elimination. A common mistake owners do trying to be conscientious is letting the pup run around or taking him for a walk before trying to train. The body may slow down making it appear more easy to control but, by this time, the pup has usually lost all it brain capacity for learning. There is no doubt that if you are fresh you also can give all your concentration and attention during this short quality period of time together. My experience in University lecturing and running gundog workshops is that people and dogs learn far more when their minds are fresh, training periods are short and the sessions are enjoyable. In this way learning is more likely to be retained. 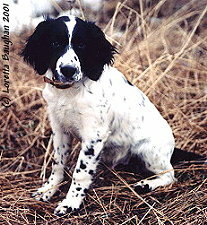 With a young pup, ten to twenty minutes maximum is enough time for training. Showing your pup how to sit, come when called and, especially with a gun dog, giving it a small number of short, easily achieved retrieves is all that is needed in the early days. Using retrieving as an example of putting your pup in a position where it can do right, initially use something it will enjoy carrying, a knotted sock, a tennis ball or a puppy dummy. Spit on the dummy so the pup recognises your scent on it and in a restricted space, such as in the hallway of your house, sit on the floor and throw two or three retrieves. Let your pup chase the retrieve and carry it around, encourage your pup up to you until it comes into your body for praise. Don't reach for the retrieve or immediately take it from him. Share the retrieve by letting the pup hold it while you stroke and praise. Don't try for perfection, just enjoyment and sharing. I am convinced that working and sharing enjoyment together is the most effective way to bond with your dog and lays the foundation for the partnership you dream of. "Time spent with you should be the highlight of your pup's day." All your actions and methods of communication must be clear, concise, and consistent. Show your puppy through guidance and management what you expect from him and demonstrate your pleasure when he does it right - a smile, a 'good dog', a gentle pat of the hand all communicates that he has pleased you and done what you wanted. As a partnership you and your dog never stop learning. Make a conscious effort to teach him something everyday and remember to do it at a time when you are both in the right frame of mind and can concentrate. Consistency and timing of rewards or corrections are an essential feature of building a strong bond. If you are Inconsistent, have poor timing and give unfair corrections you will create uncertainty, fear, and a lack of confidence and trust. These are the 'enemies' of a good relationship, and can even destroy one that has already been built. As an owner and trainer you have to set limits and boundaries as to what you will require and/or accept from your dog. I believe that dogs have more respect for owners who have set clear cut limits and boundaries for them because they then know exactly what is expected. Where these are not clearly set, many dogs will take charge of some if not all situations given the opportunity.